I had always heard great thing about Sugar Freak, but had never before had a reason to trek out to Astoria to check it out for myself. 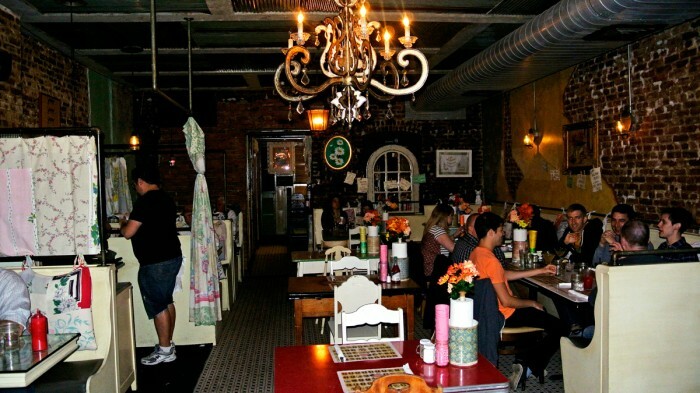 Sugar Freak is located on 30th Avenue, a bustling, gentrified strip of Queens that is lined tons of energized bars and restaurants highlighting a variety of nationalities, cultures, and cuisines. On this occasion, my friend Craig and his wife Lucia invited Amy and I out to Sugar Freak for a double-date slash birthday celebration for Craig’s big day. It’s a really fun place that has successfully tapped into the funky, vibrant energy of New Orleans with its decor, food, and drinks. The cocktail menu featured all sorts of neon colored boozy punches like you’d find around the stumbling drunk-lined streets of New Orleans such as the famed Bourbon Street. 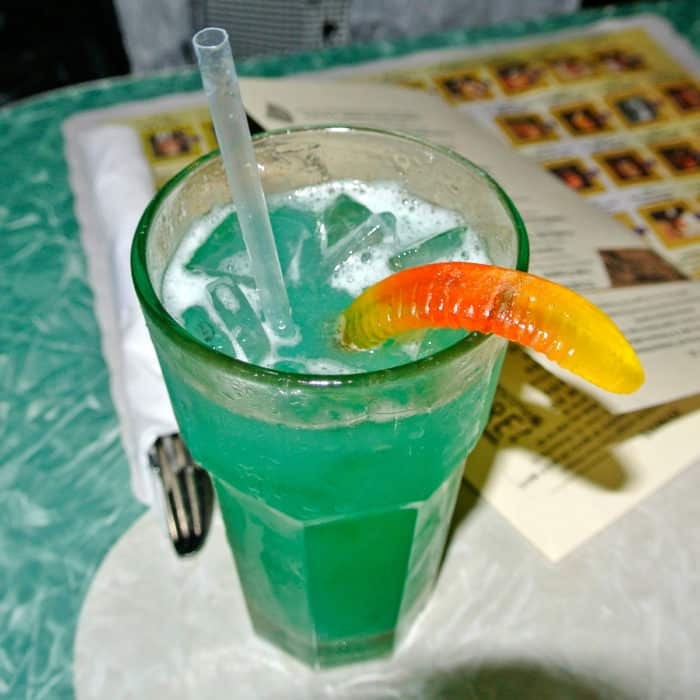 Amy chose a neon blue drink that interestingly enough featured a gummy worm garnish. It was definitely an aggressive punch-style drink that tasted strongly of booze and was unsurprisingly a bit too sweet for me. I, on the other hand, went to the other end of the flavor spectrum and ordered a Bloody Mary. Their version of the drink was also quite strong and was pretty spicy which I appreciated. 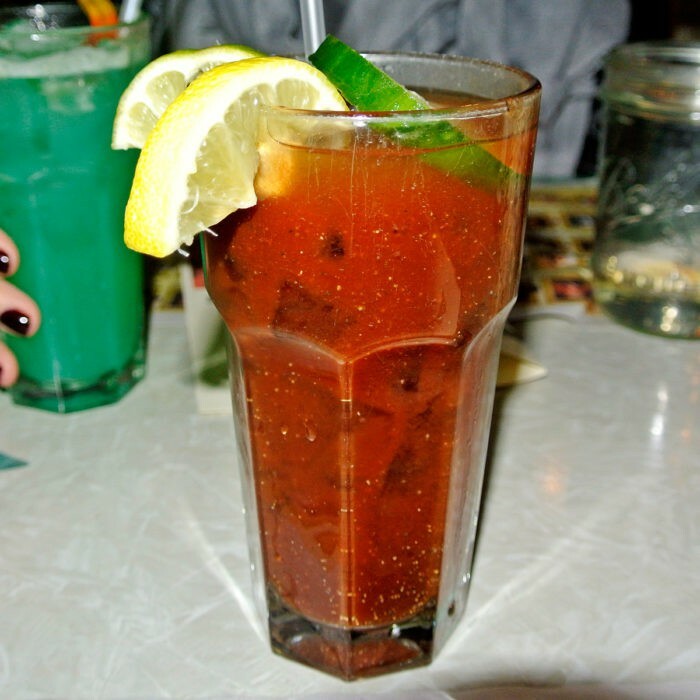 I really like a good kick when I’m having a Bloody and this one really hit the spot. To begin the meal, we got an order of Popcorn Okra for the table 1) because Lucia is a vegetarian and 2) because they sounded awesome. And they were! They were so incredibly delicious and probably too easy to keep popping another crispy veggie nugget into your mouth over and over after a quick dip in the spicy ranch sauce. That sauce was no joke either packing a seriously spicy punch in each bite. Next, we (minus Lucia) shared an order of Pork Boudin Balls and Cracklin’. 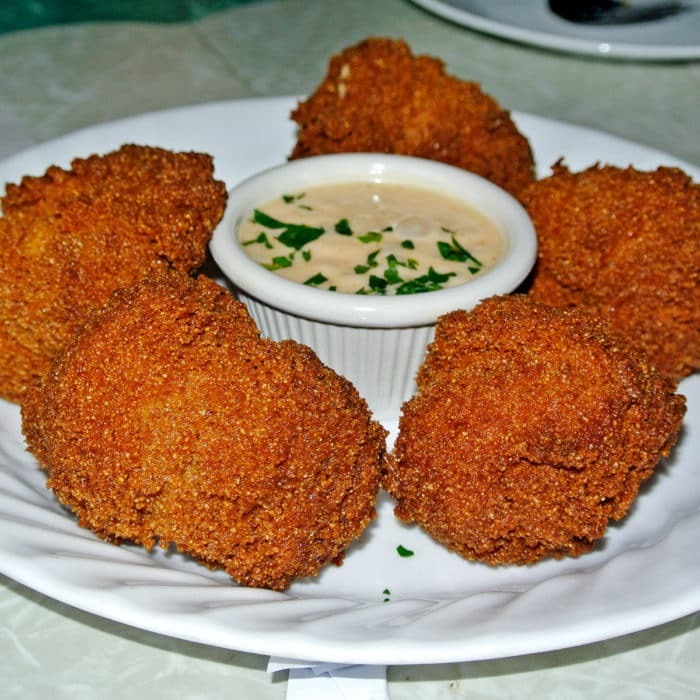 The inside was moist and tender and contrasted well with the crispy deep-fried exterior of the balls. Once again the deep-fried deliciousness was magnified by the excellent dipping sauce, this time a roasted red pepper spicy mayo. 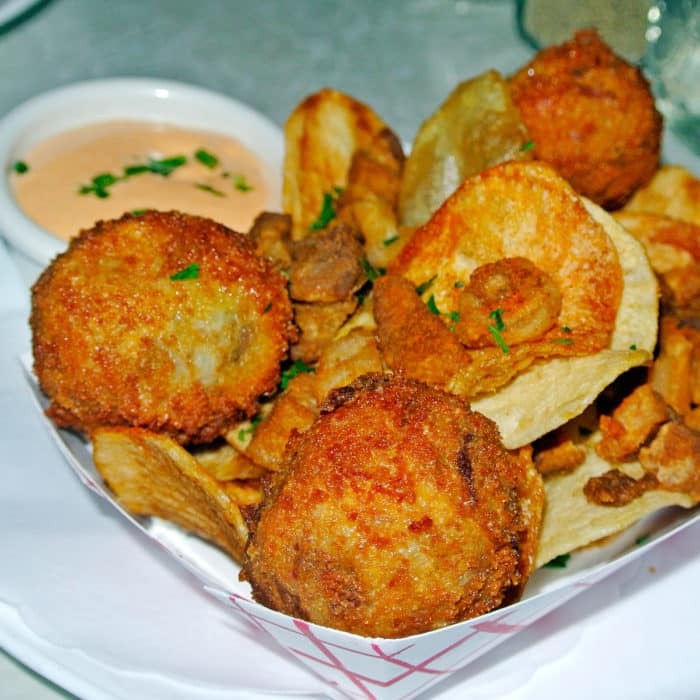 Before moving on to entrees, we shared one last appetizer, Sugar Freak’s incredible Hush Puppies. 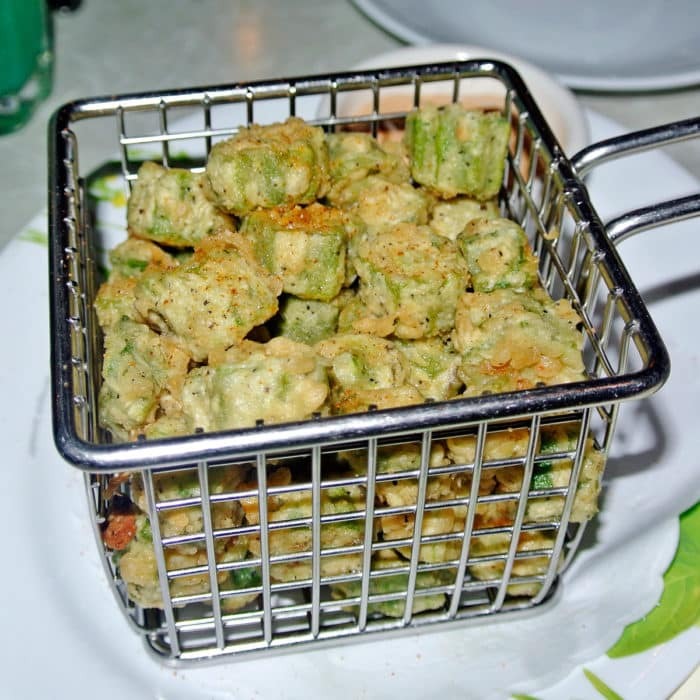 I honestly think these are the very best hush puppies I’ve tasted. Anywhere. Ever. First of all, they were massive and had this extraordinarily thick, crispy, craggy, crumbly, deep-fried crust that revealed a moist, cornmeal interior that actually tasted like corn. They came with a Rotel tomato and Velveeta dipping sauce or what Texans call QUESO. Oh god, I love queso so much and the combination of these insane hush puppies with queso was almost too much for me to handle. For my main course, I knew I could not miss out on their Jambalaya. I asked the waiter for a recommendation since there are so many mix-in options offered including eggs, andouille sausage, blackened shrimp, fried oysters, fried chicken, grilled chicken, blackened chicken, fried catfish, and blackened catfish. 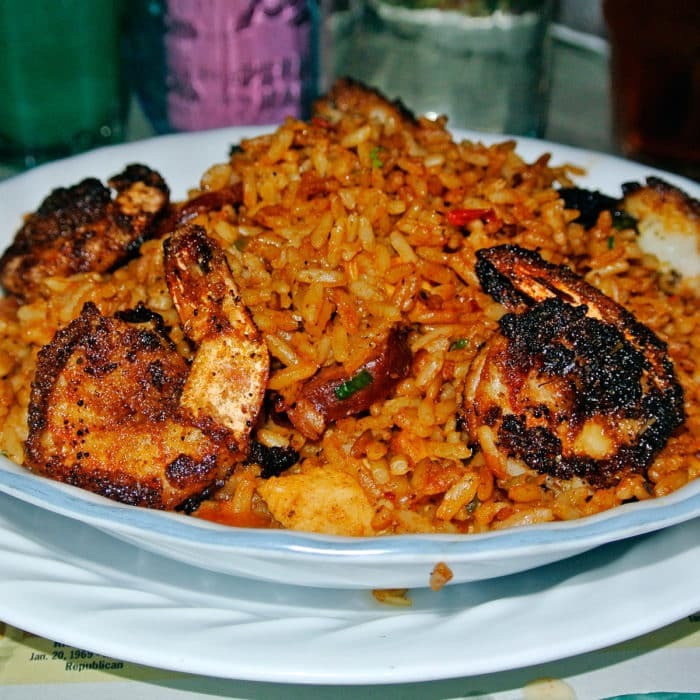 Since the jambalaya automatically comes with chicken and andouille sausage built into the rice, he suggested adding blackened shrimp, so that’s what I did. Everything about this dish was executed extraordinarily well. The rice was spicy and flavorful and the large hunks of chicken and sausage were delicious and complimented the dish really well. And those blackened shrimp were massive! Snappy and blackened perfectly. I’d highly recommend this dish. We’re not done yet though. 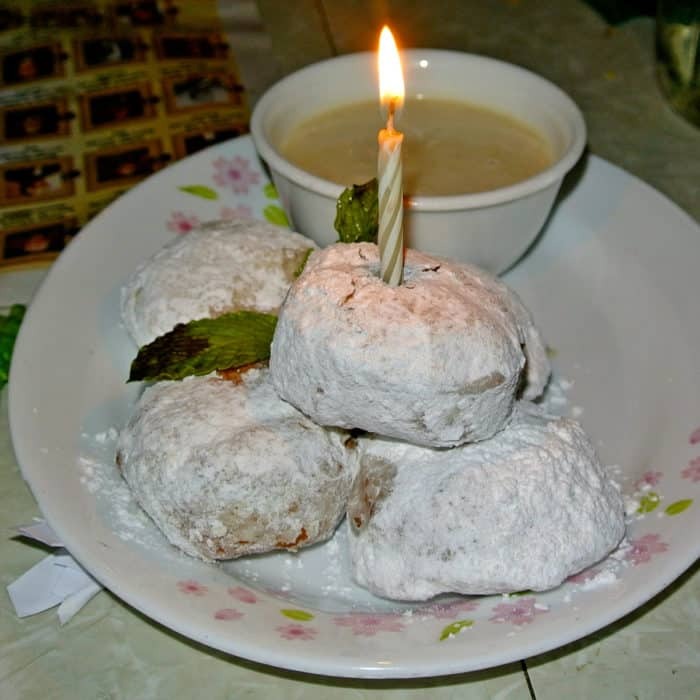 Since it was Craig’s birthday, we secretly ordered a dessert, Beignets Bananas Foster, that came topped with a lit candle and all! 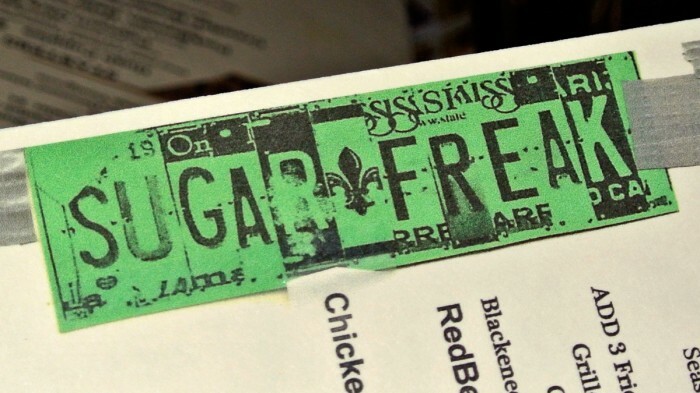 In it’s original incarnation, Sugar Freak was actually a bakery, not a full fledged New Orleans style restaurant, which makes their strange name make a heck of a lot more sense. They are pretty well known from their early days for this dessert and it certainly did not disappoint. The beignets were light and fluffy and paired really well with the incredible bananas foster custard sauce. It was pretty sweet for me, but also damn good. In conclusion, Sugar Freak made for a really fun double date night that was worth the trek out to Astoria. 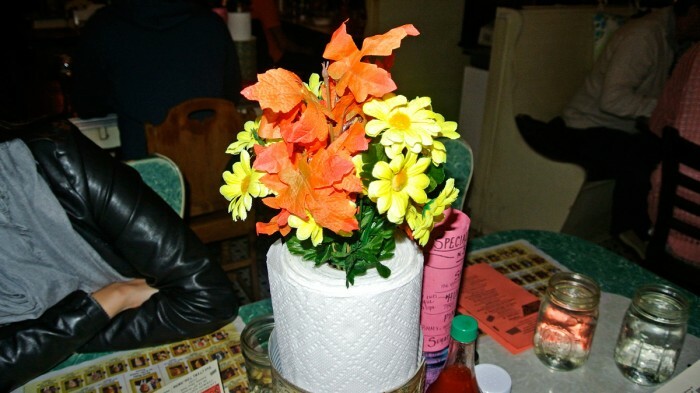 They served pretty bold and heavy food, but with New Orleans style home cooking what else would you expect? Got any other date worthy spots I need to check out in Astoria? Let me know in the comments below.